Review: Like most of my end-of-series reviews, I'll keep this fairly brief and spoiler-free. I was really nervous to read this book because it seemed like it caused SO much angst in the YA world when it came out. I have since discovered that this angst is primarily due to two things: 1) the slow pace, and 2) Tris' actions at the end of the book. Neither of these things bothered me. I thought the book was "fine." I never felt like I was dragging through it, and was eager to read it. I didn't notice the slow pace at all, but perhaps that's because it has been ages since I read the first two, so I had nothing to compare it to, and I also read most of it over Christmas break, and so had big chunks of time to read. So perhaps it was slow, and I just missed it. BUT, I can speak with confidence when it comes to the second issue. Tris' actions at the end of the book did not bother me at all because it was typical Tris. I felt like even though Veronica decided to do something fairly drastic with the story, she did not jump the shark. I totally believe that Tris, Four, Christina, and everyone else would have acted the way that they did. Does that mean that I liked the choices they made? No. Not even. But it didn't diminish the book for me at all because even though I didn't really like what happened, I felt like it was the right thing for the story. There was even sequel-phase in this story (which I usually hate) that felt totally natural and right. Anyway, there you go. I didn't hate the book, I didn't love the book, I just thought it was a satisfying end to the series and I don't regret leaving it behind now. Though, I will go see the movie, if just for curiosity's sake. TBA (Loved it!) Coming soon! My school district blocks blogger blogs (except mine for some reason...) so I will have to add this later! I bought this the day it came out, and I still haven't read it! 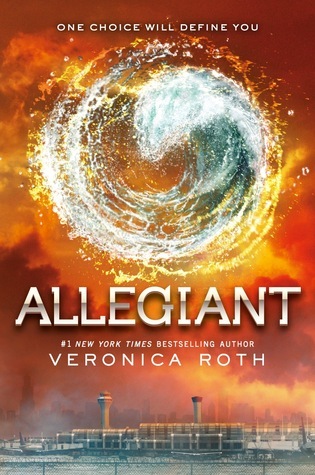 I want to re-read Divergent and Insurgent first. Of all the reviews though, I like yours the best. It made more sense to me.